Ask where to stay when in Penang and the name of Eastern and Oriental Hotel (E&O) immediately comes up to mind. 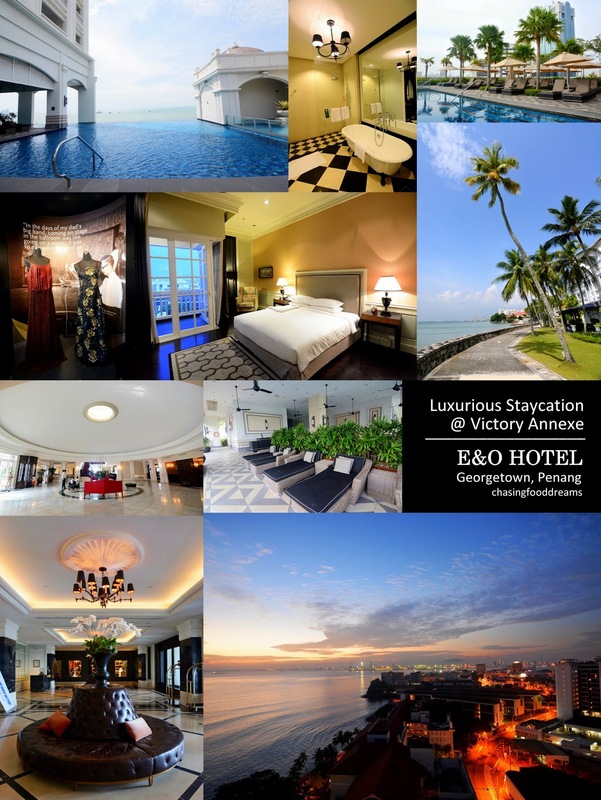 On a recent trip to Penang, we had the honors of staying at the acclaimed E&O Hotel at their new wing of Victory Annexe. Started out as The Eastern Hotel by the Sarkies Brothers – Martin and Tigran, back in 1884, the hotel later merged with another hotel, The Oriental Hotel in 1889 and became the E&O Hotel we know today. Maintaining their classic colonial architecture despite having seen two World Wars, E&O has also incorporated new life with the new wing of Victory Annexe today, giving new breathe while maintaining its origin at heart at its Heritage Wing. Despite growing up in Penang, I have honestly never stayed at E&O Hotel although I have visited the hotel countless of times for their popular buffet dining at the hotel with my family. 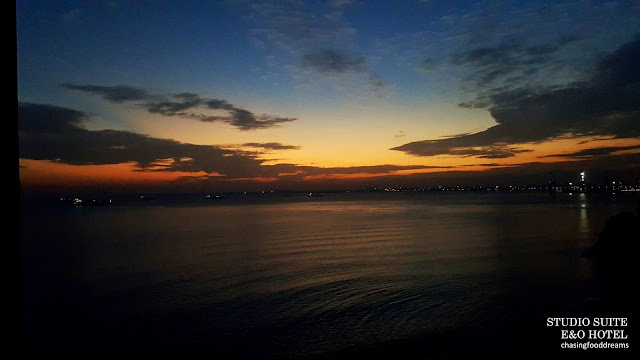 After 4 hours of driving from Penang, it was a blissful sight of the sea as we turned into the parking of the Victory Annexe where we were supposed to stay for a few nights. Parking was a breeze and we head over to the lobby of the hotel easily. The lobby at Victory Annexe was beautifully spacious, making check-ins at ease. Coupled with the friendly service at the reception, it was truly a short and sweet check-in experience before we sashayed to our room. The moment we step into our Studio Suites, one of the 118 available, we stood in awe of the gorgeous spacious room, lite up with natural rays of sunshine. Designed with elegance and simplicity of modernity in mind with lots of natural elements incorporated, the Studio Suite evoked warmness of comfort and easement at sight. We know it’s going to be a good night of sleep right away when one feels such comfort at first sight. Space is luxury in hotels and this one definitely epitomizes plushness with its space and large King-size bed flanked by two night tables with lamps. Themed with natural shades of wood and natural warm colours against white paneling, the suite may looked relatively simple but has lots of details if one look closely. At one corner of the room, there is a beautiful pastel flowery print armchair flanked by a stylish tall lamp. It’s perfect for a little reading or relaxing moment at the end of the day. At sight, I wanted to lounge there, curl up comfortably with a book. The bed looked utterly inviting. I like simplicity of whites when it comes to bedding and this one was perfect for me. Plush bedlinen thread counts feels good upon contact. Firm support with comfort, the bed and fluffy pillows were plus points for me, alluding a good night sleep to come as well. 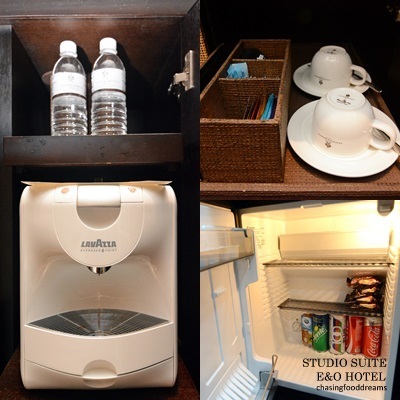 Equipped with the usual – flat screen tv, mini fridge with complimentary sodas, water tea & coffee amenities, there was also the added bonus of mini-capsule espresso coffeemaker. Snacks and milk are not included as these belong to my little one who enjoys snacking on treats. There was a work desk set with basic business amenities and stationary set. A simple plate of complimentary fruits is always a nice gesture and a reminder to eat our fruits daily. We were not prepared for the charm of the bathroom though. Designed spaciously as well, we like how the sight of the claw-footed long bath stood in retro grandeur against the checkered floor, flanked by a tall mirror panel. There was also a glass sectioned shower room equipped with rain shower. 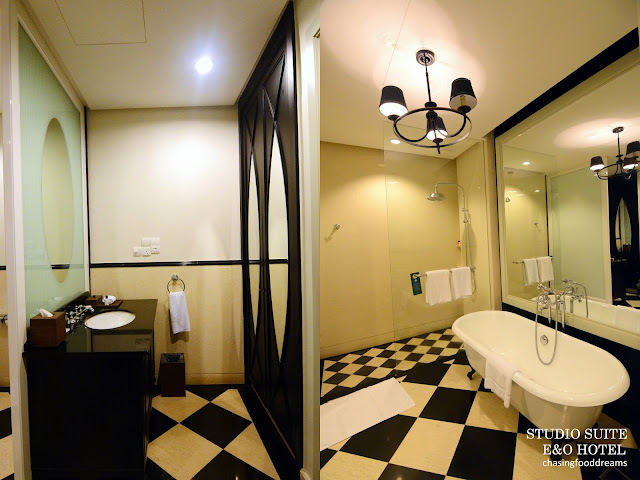 The bathroom has a sectioned off twin vanity with the usual amenities such as hair dryer, mini safe box, iron, cottony room slippers, bath robes and even sarongs for that extra Malaysian touch. 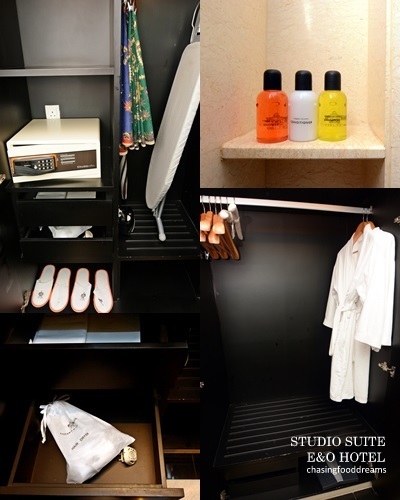 Other bathroom amenities include the usual toothbrush kit, shower cap, vanity kit, nail filer and even sewing kit that is rarely seen much in hotels nowadays. We headed down to 1885, the colonial style restaurant that was established together with the hotel for their famed English Afternoon Tea, served from 2pm to 5pm daily. Savor a wonderful array of high tea delights with pots of English tea fit for royalty. Stay tune for this post coming up! 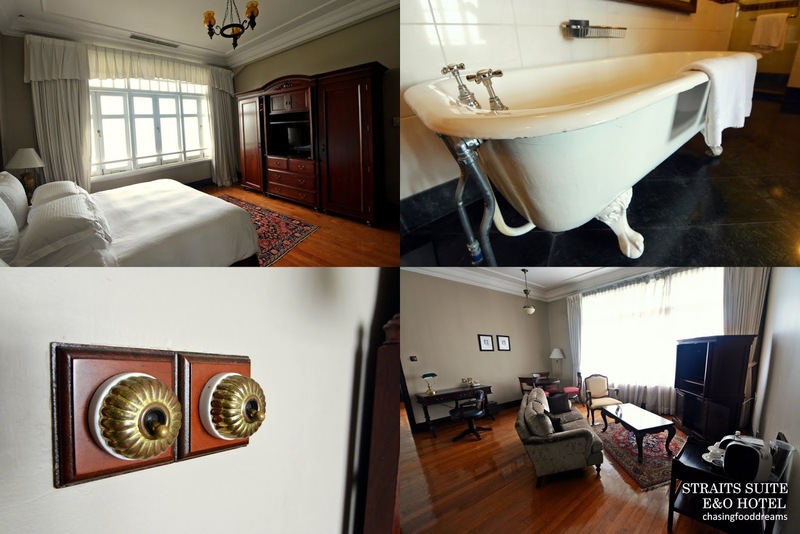 After our delicious English Afternoon Tea at 1885, we took a leisure stroll to check out some of the facilities of the hotel. Courtesy of the hotel, we were also given a guide of the Heritage Wing. 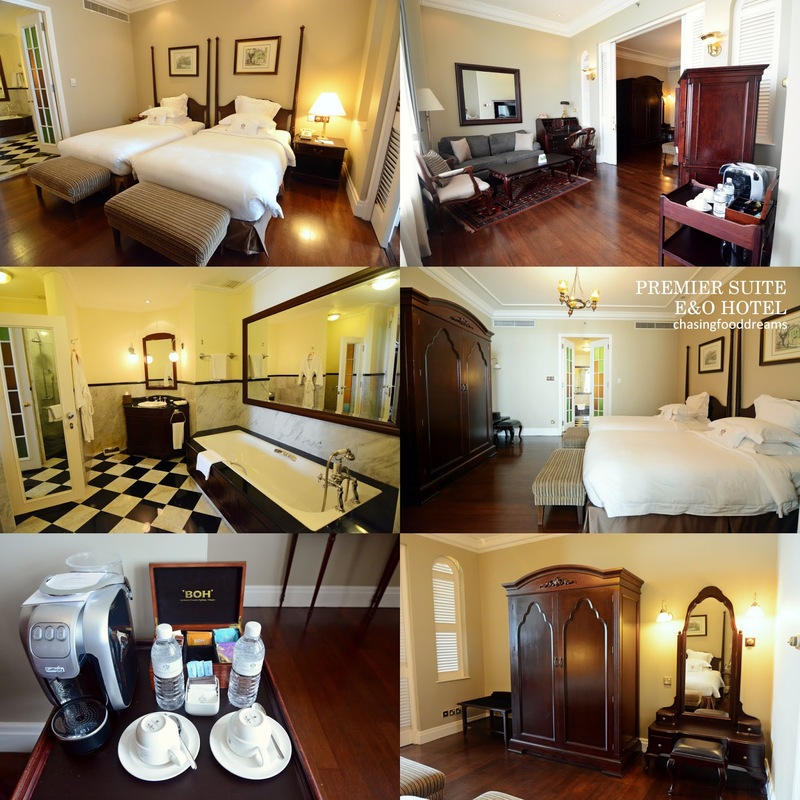 The Heritage Wing offers old world charm, beautifully maintained with colonial elegance. The foyer alone warrants a few minutes of admiration with its high dome architecture, Italian tile flooring and spaciousness of the interior design. The lobby has exquisite wood finishing with a room key board that dates all the way back to its early opening years. Elegant sofas graced the lobby of the Heritage Wing, echoing grandeur charm with other furnishings as the world continues to evolve beyond the hotel. If there is one thing I remember about E&O Hotel when I visited when I was a kid, it was this old Waygood-Otis cage lift. I am pretty sure it’s one of the oldest one in Malaysia after reading about it somewhere. I was told it is still in mint condition though it’s not being used anymore. Just glad to say that I actually experience this lift when I was much younger when my parents took me here. 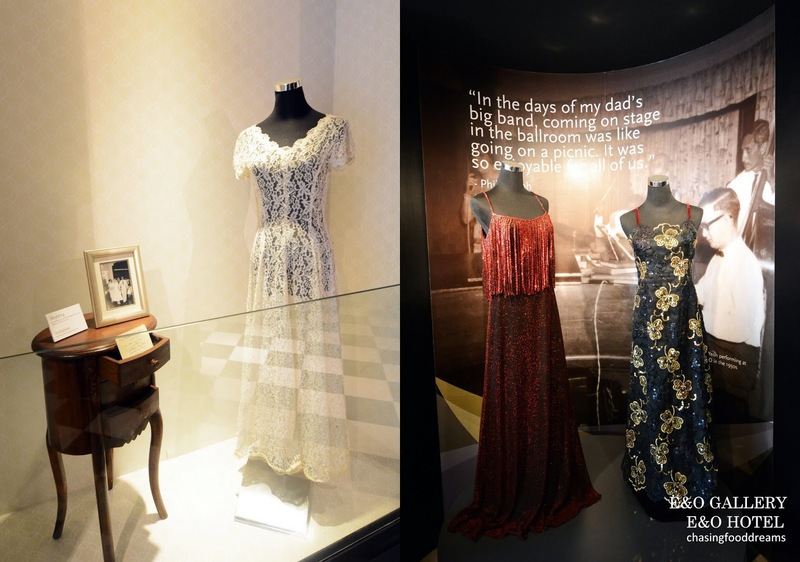 At the lobby, there was also a time capsule sealed during E&O Hotel’s 130th Anniversary on 2015 by Michael Saxon, Director Group Hospitality & Lifestyle to be open in 2145. 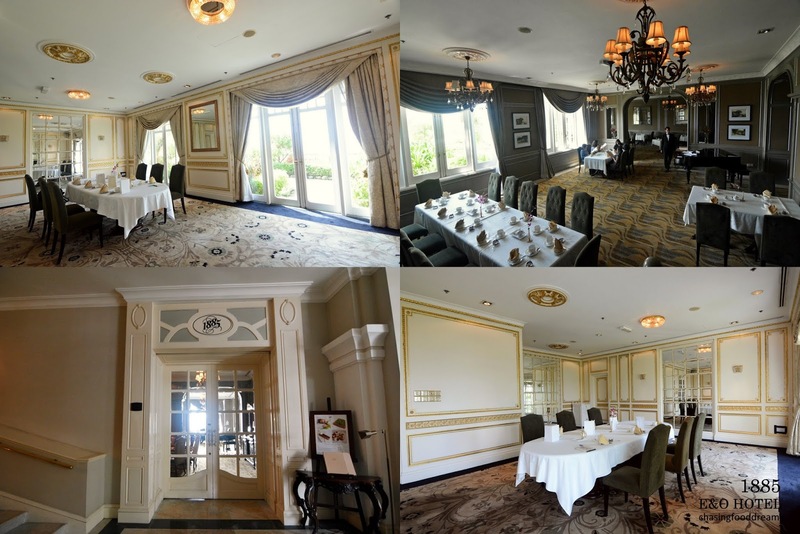 As we tour some of the rooms of the Heritage Wing, featuring 100 suites, we got a sneak peek at the Premier Suite and Straits Suite. 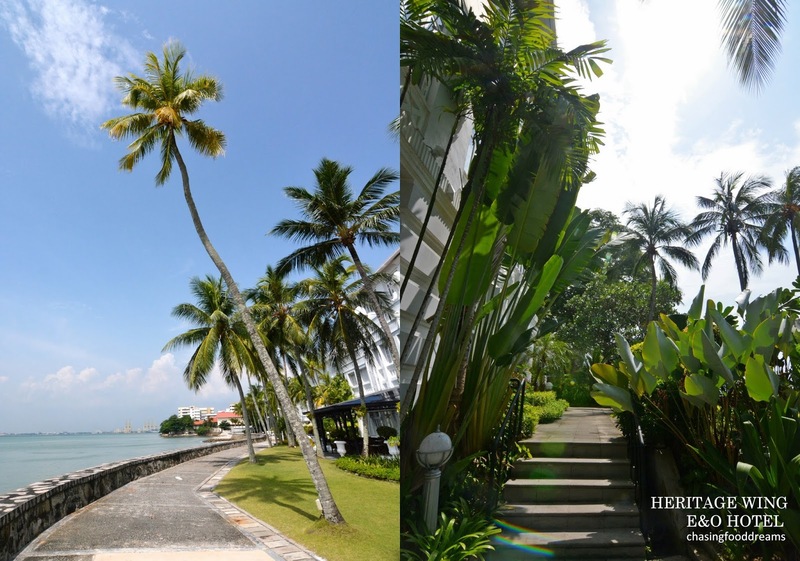 Both room types are exceptionally spacious and faces the Straits of Malacca. Restored with the East meets West themed, there are European accents with some additions of Oriental wood cabinets as well as Persian rugs in these rooms. Perhaps what truly gave the rooms its own unique character are all the small details of fixtures restored from the original hotel such as this light fixture. 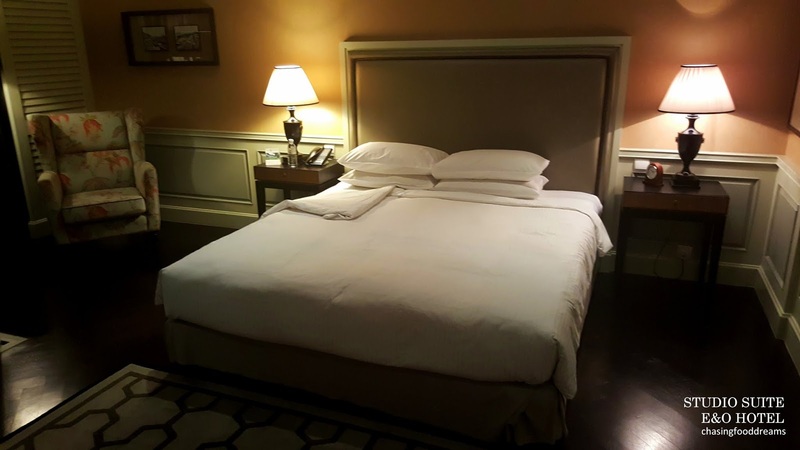 There are also special services provided when one stays in Heritage Wing such as complimentary valet parking, personalized check-in by a butler, your very own 24-hour butler at your service, free yoga services and breakfast at Sarkies Annexe. 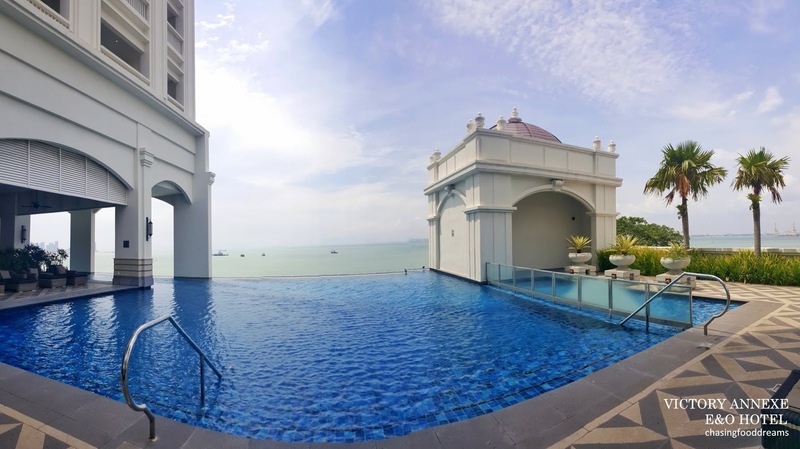 One can also enjoy the gorgeous swimming pool with an amazing view of the Straits when staying at the Heritage Wing. With the sun shining brightly that day and a gentle breeze in tow, I wanted to chuck my lens away, put on my swimwear and simply lounge by the pool to soak up the dazzling day! After our little hotel tour, I headed over to their award-winning Panpuri Organic Spa Penang for some luxurious pampering session. Stay tune for this spa review in the coming post. Besides spa, there are other things to do at the hotel. One can utilize the fully equipped gymnasium to work out some sweat or head over to the hotel’s in-house library for some good reads. When one stays in Victory Annexe, one is also entitled to daily evening cocktail hour at Planters Lounge where small bites are perfect with your own DIY cocktails. We only managed to visit the cocktail hour briefly and even then, it was packed with people enjoying themselves to all the goodies that weekend. What I really enjoyed was the swimming pool at Victory Annexe. Featuring an infinity deck pool with spectacular view of the Straits as well but from a higher level, echoing a very different vibe from the other wing’s swimming pool. There was an element of romance as well as Zen-ness to this swimming pool. Lots of lounge chairs, well-shaded for comfort relaxing, surrounded by landscape of lush greenery of palm trees and small bushes was utterly impressive and alluring at sight. It was a glimpse of safe haven for my sanity. As one relaxes and enjoy the gorgeous blue skies filled with cotton candy clouds and azure water, I never wanted to leave this moment then. The whole ambiance also makes perfect view for picturesque social media pieces. Hotel guests were literally snapping away while I watch in delight before succumbing to taking a few pictures for my own with my little one too! 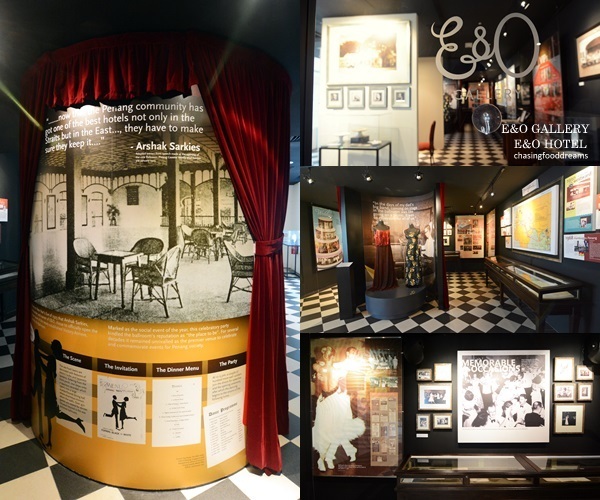 If you’re up for a little historical tour, do visit the E&O Gallery located within the Victory Annexe retail arcade to learn about Penang’s social and cultural milestones as seen through the eyes of the hotel and its patrons. The glitz and glamour of those days of all the grand parties, banquets, weddings as well as entertainment with distinguished guests as well as the changes of the hotel are all displayed at the gallery. I heard Rudyard Kipling, a famous writer, was even staying here at the hotel too. It was opulence all the way when E&O was the centre of social life in the Pearl of the Orient. Ladies dressed up in beaded gowns, clinging on to the arms of their gentlemen dressed up in tuxedos, enjoying the social life of sipping cocktails and catching up updates as well as meeting new friends and business opportunities. There are certainly plenty of information at the gallery to keep on busy for a few hours. There’s also complimentary Shuttle Service from E&O hotel to Lone Pine Hotel and Straits Quay for some sightseeing as well as shopping daily. Last but not least, E&O Hotel offers plenty of good eats at all their dining outlets. There’s 1885 where we had our English Tea. 1885 also serves fusion dishes to be enjoy with wines set in fine traditions of colonial style dining. For casual dining, there’s Sarkies Corner as well as Farquhar’s Bar. One serves local and international cuisines set in colonial coffee shop ambiance while the other features pub fare and English Sunday Roast with a typical English bar setting named after one of Penang’s Lieutenant-Governor, Robert Townsend Farquhar. 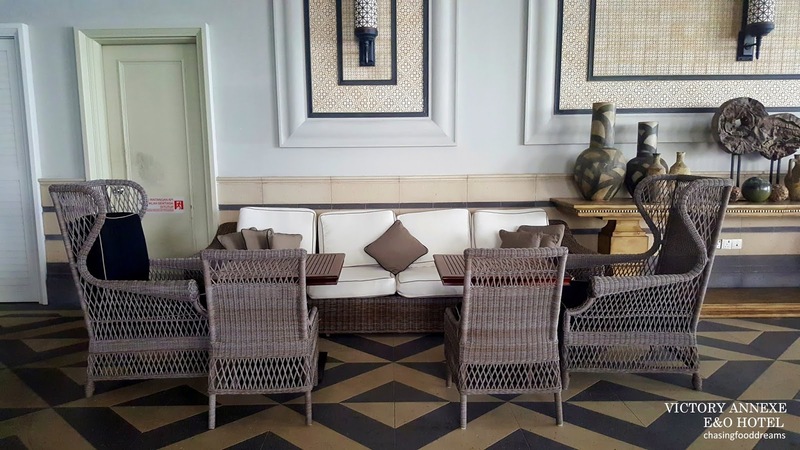 There’s Sarkies, a popular hotspot, offering their famed buffets and selections of local and international fare as their all-day-dining restaurant. 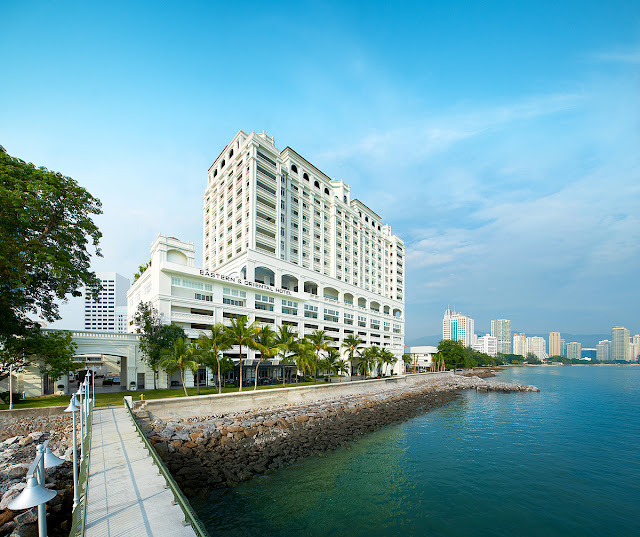 This restaurant is what Penangites flocked as the hotel is famous for their luscious spread of buffet filled with loads of scrumptious dishes. We dined here for lunch during out stay and wait till you check out the spread in my next post. As the evening sun goes down, the view from my Studio Suite was absolutely stunning! We turned in comfortably for the day and woke up early the next morning to catch sunrise as well as a lovely breakfast at Planters Lounge. Stay tune for the breakfast post. 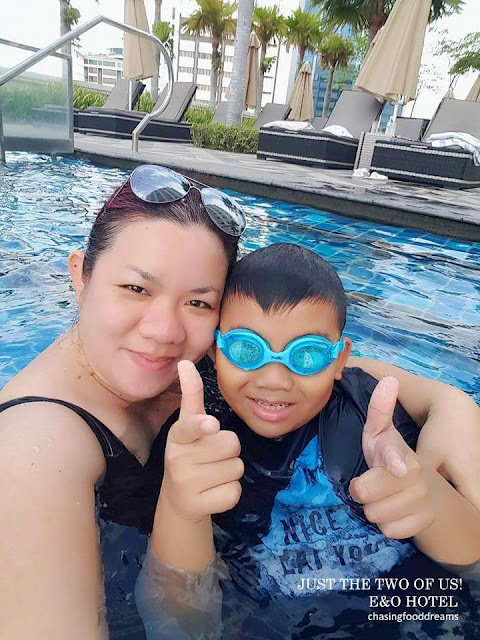 Our stay at E&O Hotel at Victory Annexe was truly relaxing and satisfying from service to the hotel’s facilities and room. Even though we stayed at the new wing, there’s something truly charming about the hotel as we wandered along the spacious beautiful corridors of the hotel. From the pith-helmeted bellhops on the khaki-clad doormen to the smartly dressed wait staff, they would be smiling and greeting me as I walked pass them. My suite was very comfortable and rendered a very satisfactory stay with a gorgeous view of the Straits. If you’re looking for fine comfort and services, The E&O Hotel has certainly lived up to its reputation of the finest on the isle.